SponsorPitch would be nothing without the loyalty of its now, rapidly approaching 20,000 members. That's one of the reasons that we've tried to keep as much of the network free to you as possible, while still paying the bills and building a growing business. About two years ago we added a simple jobs board when agencies started to ask us how they could access our growing membership base to find new talent and fill senior level positions. 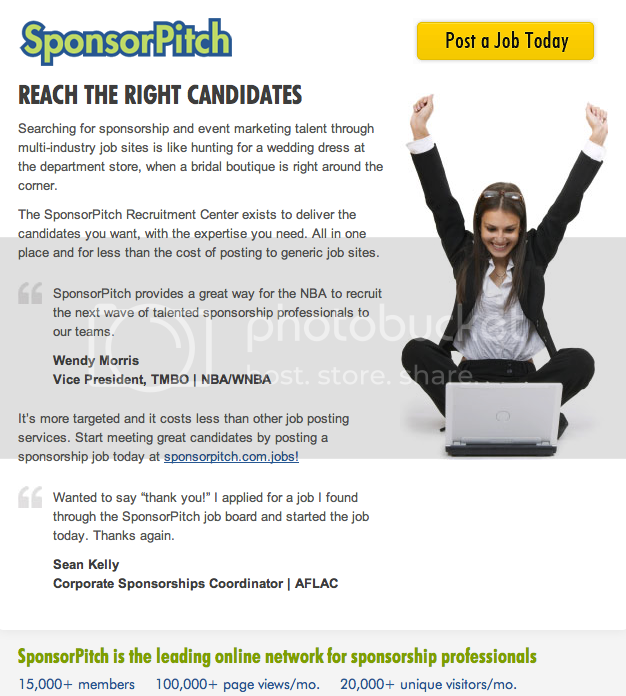 We knew we were on the right track when job seekers around the industry started to refer to SponsorPitch.com/jobs as one of the go-to resources for landing a new gig. With that said, I am super excited to announce that even more SponsorPitch members will get to use it to put their 2013 career goals in motion. We've opened up our Jobs Center for free through the end of January (and possible longer depending on how this experiment goes). Since you won't have to pay to access the latest opportunities, is there some other way you can still help us out? Well, yes there is! To keep it free, we'll need your HR folks and recruiters to know this new posting option exists (that's not too much to ask is it? :)). Please forward this link: jobs.sponsorpitch.com to "hiring people" and let them know that they can meet other great candidates like you by posting a job on SponsorPitch. There's no sign-up required to post a sponsorship job, but they can if they like. Also, during January they can use the promo code job25 to take 25% off each post. All job posts are accessible to all members and anyone they forward the post to. We also promote all paid job posts in SponsorPitch's social channels (10,000+) and daily email (5,000+). This is just the beginning. There are many more features we want to add to help recruiters connect with the right job seekers, and vice versa. By helping us get the word out about posting jobs now, you'll ensure these feature enhancements happen that much faster and that we can keep the jobs board open to all members beyond January.